EVEN IF VALENTINE’S Day isn’t your thing, you’ll still be able to appreciate a love story like this. Ashley McIntyre heard about Danny Robinson–a 25-year-old dialysis patient–last year, when her mum heard him speak on local radio. He spoke about being on dialysis for 12 hours a week following kidney failure as a result of Berger’s disease. He seemed to be having a string of bad luck, his house was destroyed in a house fire on Christmas Day 2011, and his father died in 2012 from brain cancer. “It was just like one thing after another for them,” McIntyre told ABC News. ”I was like, well, I’m type-O and I don’t have any health problems”. It was just one match after another. I thought, This can’t be coincidence. Turns out, it was a perfect match, which occurs in around 1 out of 100,000 cases. Just to sum up the odds, the Courier Journal reports that only 1 per cent of living kidney donations are from strangers, and this was likely the only one in Kentucky last year. The surgery went ahead in April 2014. According to Sky News, they met a month before the operation, and kept in touch until they started dating in May. Robinson proposed on Christmas day, and the pair are expecting a baby girl in June. I never in a million years imagined this would happen. It was a whirlwind. It’s crazy how it all worked. It was all planned out by God. 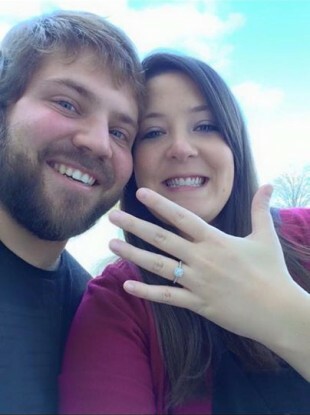 Email “Woman gives stranger her kidney, ends up getting engaged to him”. Feedback on “Woman gives stranger her kidney, ends up getting engaged to him”.